For this week's giveaway, we've teamed up with CalDigit to offer MacRumors a chance to win one of the company's TS3 Thunderbolt Station 3 docks. The TS3, designed to connect to Apple's most recent Thunderbolt 3 Macs, features a sleek ribbed aluminum enclosure and adds a range of functionality to machines like the MacBook Pro with its wealth of ports. At the back, the TS3 offers two USB 3.1 Type-A ports, two eSATA ports, a Gigabit Ethernet port, a DisplayPort, and two Thunderbolt 3 ports. At the front, there are audio in and audio out jacks, along with a third USB 3.1 Type-A port. All of the ports are accessible through a single connected Thunderbolt 3 cable, which also provides charging. CalDigit's TS3 is one of the Thunderbolt 3 docks on the market that's able to offer full 85W charging to the 15-inch Retina MacBook Pro, so there is no compromise to be made when it comes to charging speed. 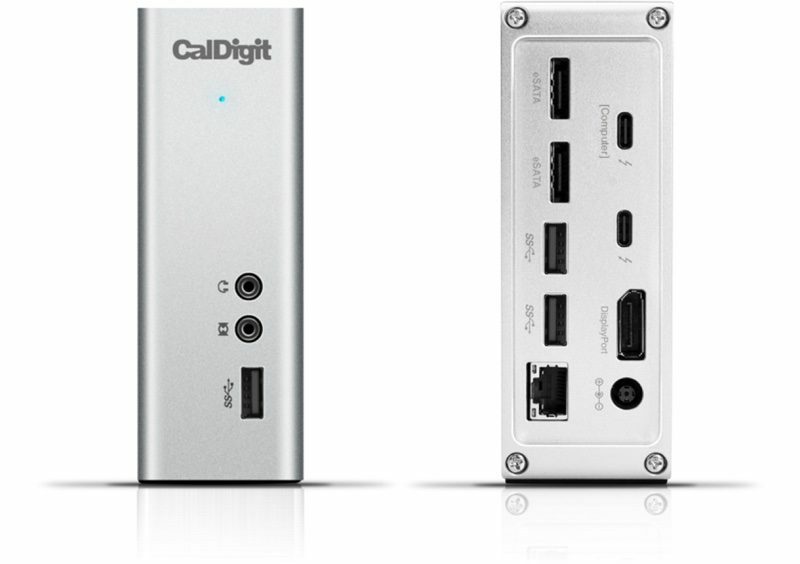 It is compatible with all Thunderbolt 3 Macs and supports a single 5K monitor or dual 4K monitors. We reviewed the TS3 earlier this year and we were impressed with the design and the balance of features it offers, along with the 85W charging, and it's one of the only docks to offer eSATA ports. CalDigit normally charges $250 for the TS3 Thunderbolt 3 docking station, but we have two to give to MacRumors readers. To enter to win, use the Rafflecopter widget below and enter an email address. Email addresses will be used solely for contact purposes to reach the winner and send the prize. You can earn additional entries by subscribing to our weekly newsletter, subscribing to our YouTube channel, following us on Twitter, or visiting the MacRumors Facebook page. a Rafflecopter giveawayThe contest will run from today (October 6) at 11:00 a.m. Pacific Time through 11:00 a.m. Pacific Time on October 13. The winners will be chosen randomly on October 13 and will be contacted by email. The winners will have 48 hours to respond and provide a shipping address before new winners are chosen. It looks great. But I still can't believe that one needs to spend hundreds of dollars to connect things I used to take for granted. To an overpriced (albeit great) laptop. This looks fantastic. Wish I wasn't living in Canada! What it lacks in the 'sleek' dept, it makes up for it by being one of the few docks charging at 85Watts. But when can we expect to start seeing more docks featuring USB 3.1 Gen2 (@10Gbps) for a little future-proofing, considering the price of some of these hubs?